On a clear January morning in Abbotsford, Kayla Feenstra nails shingles to her house. Thirty years old and self-employed, she has what so many living in Metro Vancouver at her age only dream of: her very own, mortgage-free home. It may only be 130 square feet and on wheels, but it’s hers. And while there’s still some work to be done on the house, so far it’s only cost her $15,000. 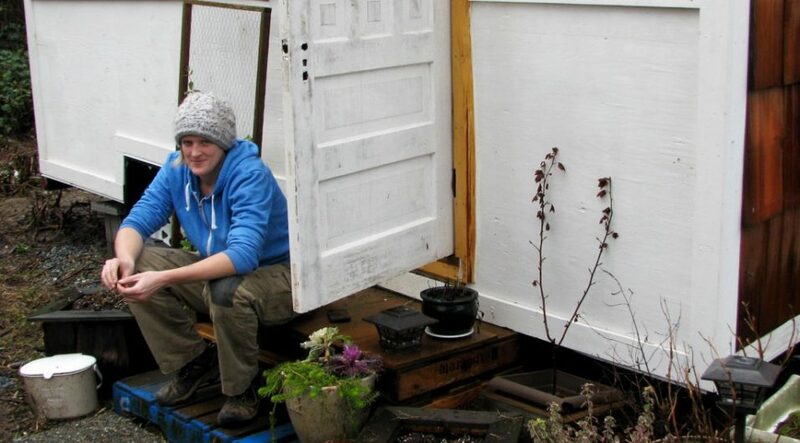 Feenstra moved into her tiny house—called Jack in a Box—last spring, and she couldn’t be happier with her new home. “I wish I would have done it when I was 19,” she says, sitting on a bench seat in front of the bay window in her living room area. The tiny house is painted red and white, but will soon be completely covered over with wooden shingles. It has a flat roof and a trail of paving stones leading to the front step. Inside, a tiny wood-burning stove provides heat, and a ladder leads up to the loft where Feenstra sleeps in a queen size bed. Her golden doodle Scotch sleeps on a doggie bed downstairs, and comes and goes as he pleases throughout the day, chasing down coyotes and rats on the seven-acre lot where Jack resides. Feenstra cleared the land on which the house sits as part of her agreement with the landowners. In lieu of paying rent, she put her professional landscaping skills to work clearing the land, and planning a vegetable garden. A flock of geese pass by overhead as she points to where the pond will go, and the nearby spot where she eventually plans to move Jack so she can build out the front porch. What Jack lacks in interior space is more than made up for by the outdoor space that surrounds the house.